Black is for sins we made. 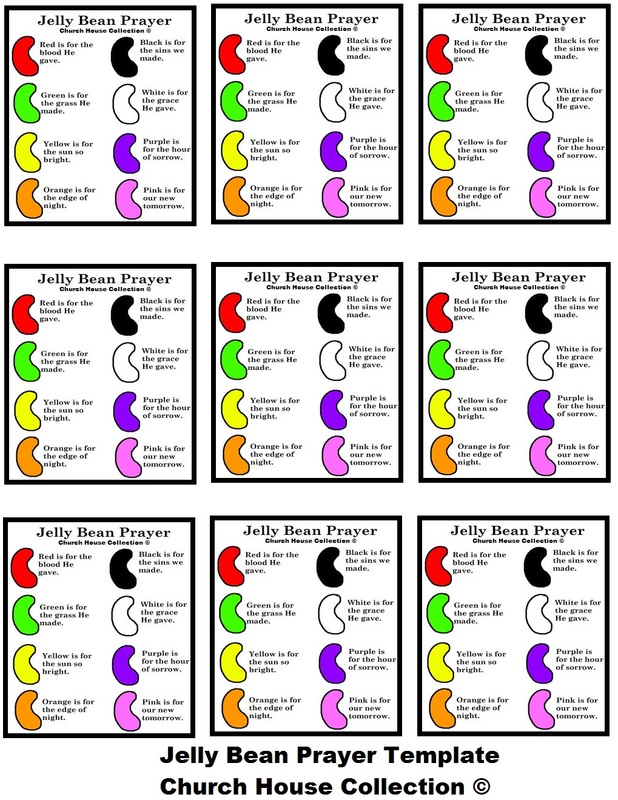 This is a printable sheet that has 9 Jelly Bean Prayer templates on it. It has 8 Jelly bean colors with a short saying next to each one. Each color of the jelly bean represents something. Print the Jelly Bean Prayer Template out and use for many different things. Try taping them to silly straws and stick the silly straw down into an apples. I actually made these for the kids at Church. I called them Jelly Bean Prayer snacks. Tape these to popsicle sticks and stick down in cupcakes. Add jelly beans to the top of the frosting on the cupcakes. You could also have the children make a Jelly Bean construction paper craft. 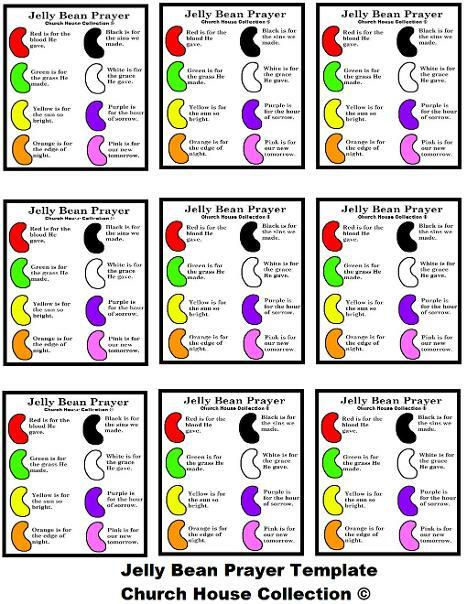 Just print this template out and cut them out and hand each child one of the jelly bean prayer templates. Have them tape or glue down the template to the paper. Have them cut out jelly bean shapes from white paper and then color them or just have them draw jelly beans on their paper and color them. Have them add their own color of jelly bean and have the child make up their own saying. Like Blue is for the water that God made or for the blue birds that he created. Gray for the dark clouds at night. Brown for the dirt God made. Or you could make a gold glitter jelly bean for the streets of Gold in Heaven. Just smear glue on the jelly bean that the child drew and add some gold glitter. Just have them create their own and they can even use the same colors like Red and Green but have them create their own sayings with them. This will help them to think about things that God created. Just let them be creative.